Amos’ powerful words in Amos 8:11 are not a prophecy that we expect to have a dual fulfillment in our time, but they are a stark warning to us, (whether we are ‘in the ministry’ or not) that we should not neglect the Word of God, or become over familiar with it. Jesus had the same attitude to the Word of God, even to the extent of declaring in his time in the desert, whilst on a 40 day fast, “It is written, “‘Man shall not live by bread alone, but by every word that comes from the mouth of God.’” And if as the apostle Paul says, “All Scripture is breathed out by God and profitable for teaching, for reproof, for correction, and for training in righteousness” (2 Tim 3:16), then what Jesus is refering to is most certainly, the written Word. Whether we are hearing or reading the words of God, we need to ensure that we are giving due dligence to them to see what God is saying to us, about us, whether he is encouraging, warning or disciplining us and then responding in an appropriate manner, in faith and obedience. Paul Cain is an excellent example of this pursuit of God. 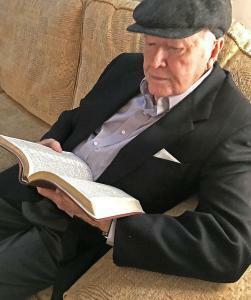 At age 88 he still gives time to reading, rereading, studying and immersing himself in the scriptures. His love for the King James version is well known, and he is the first to assert that until you follow Timothy’s encouragement to, “Study to shew thyself approved unto God, a workman that needeth not to be ashamed, rightly dividing the word of truth” you will rarely be able to discern what God is really saying when it comes to the prophetic ministry. The bible tells us what God is saying, and to some extent, what he is not saying too. We must give ourselves to the bible. We need revival, we need the power of the Spirit in our lives, we need accountability, clarity of vision and purpose – but we need, far more than we think or imagine, God’s words, revealed in Scripture. Can you imagine what it was like for Jesus as he sang the magnificent words in the psalms, knowing that they spoke about Him. Consider then, toave you seen the promise, hope and encouragement that the bible says about you? Like Paul Cain’s habit of prolonged bible-reading, we must develop a deep longing, passion and pursuit of God that ends in us having a relentless desire find ourselves in Psalm 119. It’s a long read, but the wealth of all that it ignites in our heart and life, is unspeakable. This is the time for unprecedented committment, maybe that should include letting the Word of God become the radical obsession of our heart.